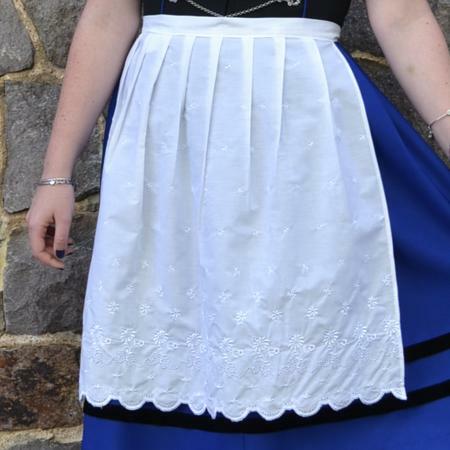 Women’s Tracht apron with lace and scalloped bottom. Ladies black and blue dirndl with black cording around the neckline. Features a blue apron with floral embroidery (included). Blouse shown in photo is not included. Made of 100% polyester. Imported from Germany. Blue and white checkered mieder blouse with leather embellishments. Floor length women’s skirt in tan color. Features leather strap at bottom of skirt. Made of 100% linen. Imported from Germany. Black suede belt featuring three edelweiss flowers. A short ruffled white blouse featuring puffed sleeves. Black dirndl with purple and pink flower embroidery. A ladies white and beige button down shirt, with a gold filigree and floral design on it.